The mackerel, scad and garfish turned up before last week's storms and me and my pals were hoping that the rough weather hadn't put them off again. In fact I've been a couple of times to different spots to see what the state of play was." 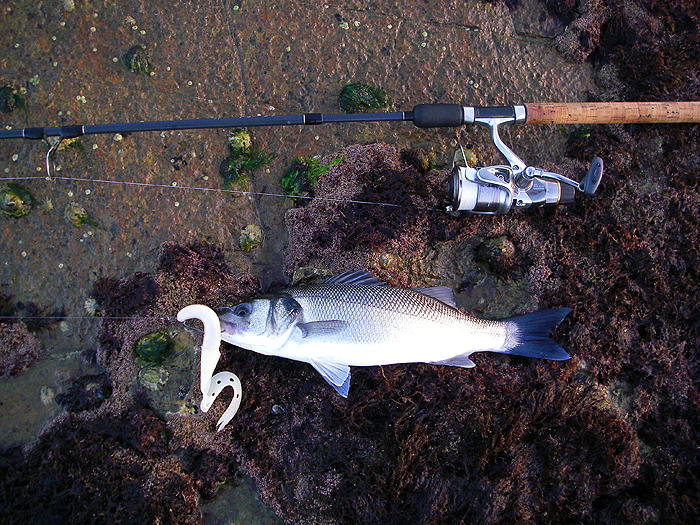 My first session was to fish a tide race early in the morning. When I arrived in the dark I found someone was already there. "Buns!" I muttered but then the shadowy figure said "Hello Mike." and all was well. There is just room for two people to fish the spot as long as they're pals. To cut a long story short the two of us flogged away for a while without a bite. Conditions looked perfect with a strong run of tide and clear water but our plugs and Evo-Stix were totally ignored apart from a garfish foul hooked on my pals surface lure. Not a vestige of a fish was to be seen for three-quarters-of-an-hour then suddenly the water erupted with whitebait and they were clearly beaing harrassed by larger fish which boiled and slashed only a metre or two from where we stood. 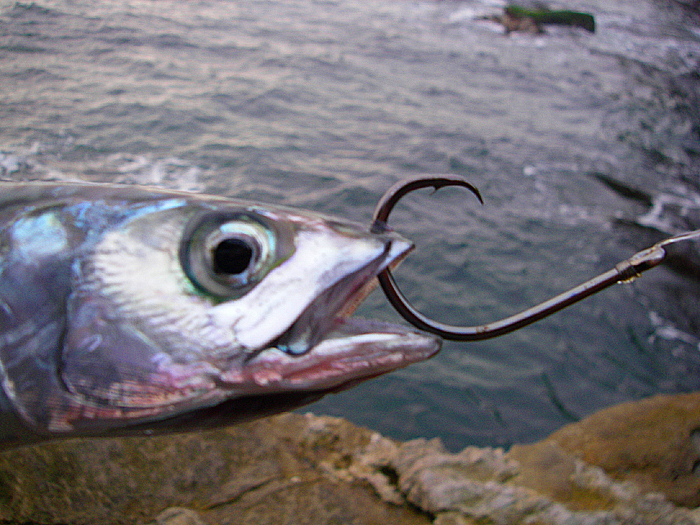 We couldn't buy a take and (unlike me) I changed lures trying a Mepps and a tiny spratlike Rapala - all to no avail. It was ultra-frustrating. Clearly the fish were preoccupied with tiny sprats. It was just about packing in time and I said to my pal that I was going to have one last lure change. I rooted about in the bag and dug out my largest Slandra, commenting that I might as well try something ridiculous. On my fourth or fifth cast, much to my surprise, I was in. 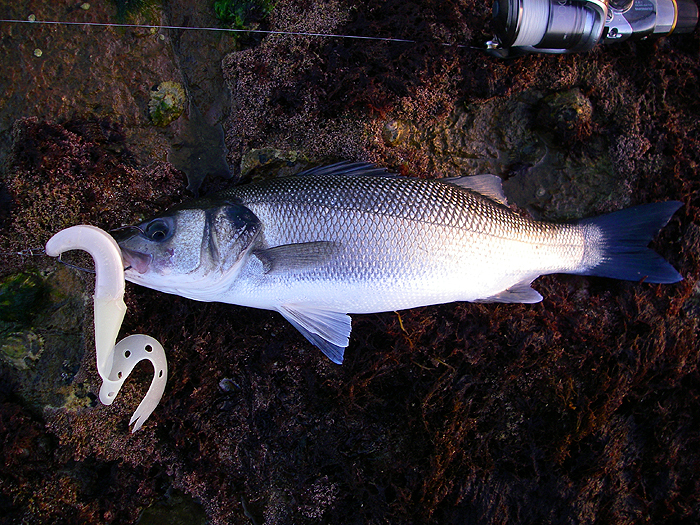 It turned out to be a modest (but not tiny) bass which was duly, landed, photographed and returned. It just goes to show that 'matching the hatch' doesn't always pay. 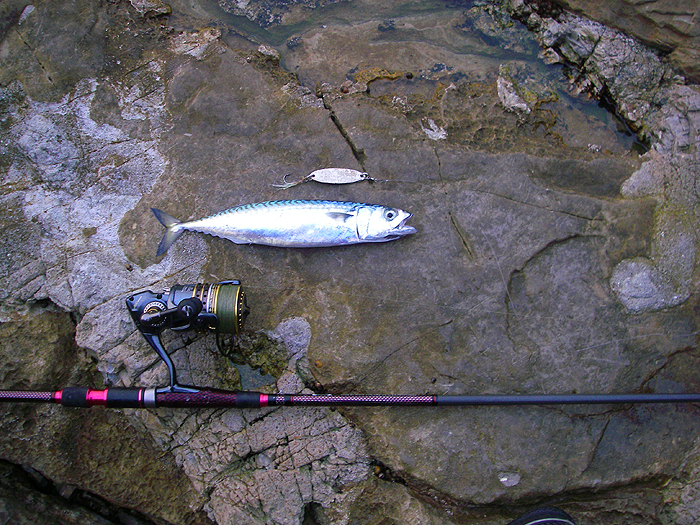 My second trip was to a ledge where I generally catch pollack and mackerel which I can use as livebaits for bass. 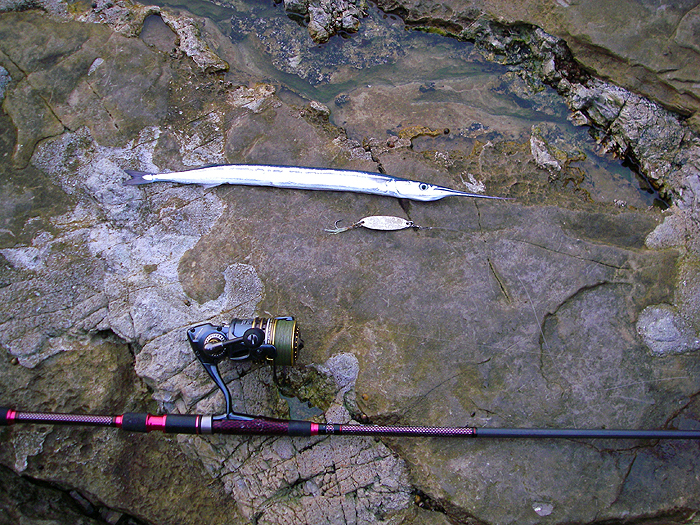 I started before dawn using a single hooked wedge and as it turned out my first fish was a garfish. Not ideal for bait. However it wasn't long until I had a mackerel which I put onto the circle hook and allowed to swim off. For the rest of the session I simply stood, holding the livebait rod. Although I know I could have been catching fish on lures or flies I'm sure that sooner or later I'll get a good bass on the livebait. Patience Mike!! !